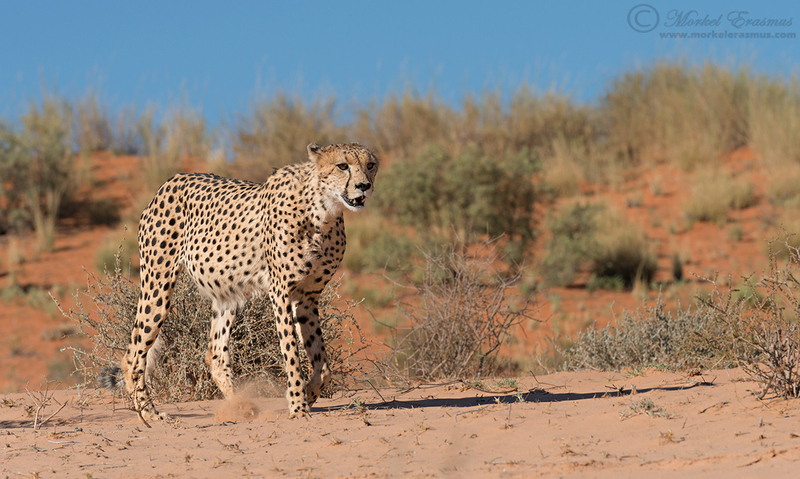 During our recent family safari to the Kgalagadi Transfrontier Park, we came across two male cheetahs who were strolling down the dry Auob riverbed with full bellies (having made a kill earlier that morning). We drove next to them for probably 8km, and after they slaked their thirst at the Kamfersboom waterhole, they crossed over the road and onto the dunes next to us. I managed to get a couple of photos of them in this typical Kalahari setting by repositioning the vehicle as they moved along the line of the road. At times they were close enough to reach out and touch - a special Kgalagadi sighting. It was already mid-morning so the light wasn't at its absolute best, but once they did cross the road some photos were manageable. I just love the red sand and blue sky surroundings here, making it unmistakably Kalahari. Great picture, Morkel! Thank you for sharing it before your trip!